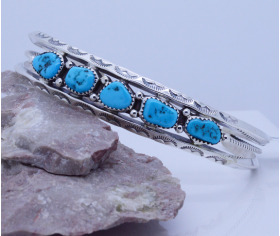 Navajo made, sterling silver, five free form turquoise stone bracelet with triangle wire borders. Measures 11/16"W. This is a "men's" size bracelet. Exclusively here directly from it's Designer Artist ! All our jewelry include a gift box.